Grammar is an extremely important IELTS writing grading factor. Our finding also shows that a coherent answer`s with well connected ideas triumph. We observed that answers rated as fully "task relevant" significantly outperformed answer that covers just a single part of the prompt. Based on our analysis, we found that argumentative writing strategies scored higher. Signaled conclusion doesn’t correlate with higher grading. Bad spelling and punctuation lowered the band score. Word choice matters. Based on high band samples, answers contained common and uncommon vocabulary with flexibility and accuracy performed better. Despite paragraphing is most common in answers, more logically paragraphed ones scored very well. You may probably heard about the proverb “What goes around comes around” or “as you sow, so shall you reap”. Similarly, listen to this new proverb:”As the Question, So the Answer”. In other words, write as the question asks you to write. Don`t write about a single view of the task when it ask you to discuss both views.. plus give opinion- so that your answer don`t miss single or multiple requirement of the task. That`s so simple and so overlooked. Band 9: Fully address all part of the task. Band 8: Sufficiently address all part of the task. Band 7: Moderately address all part of the task. Key Learning: Address all part of the task as fully as possible in your answer to achieve band 7 or above. We found that comprehensive argumentative strategies to expand main points of the essay significantly outperformed the low band answers. You may know that a good paragraph contains one idea at a time. The writer places this single idea at the beginning and develops it in the next sentences of the paragraph. Do the next sentences (after topic) agree with the main idea? This is interesting-a writer develops main ideas differently across band 7 to 9 answers. Band 7 answers: Main ideas are expended and supported throughout the response although the relevancy is questionable in some cases. 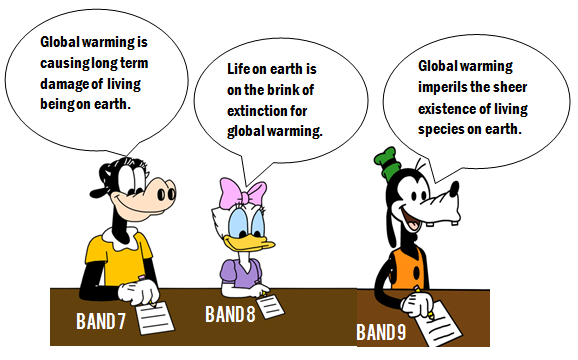 Band 8 answers: Main ideas are well developed with Relevant, extended and supported ideas. Band 9 answers: Main topics of paragraphs are well supported with proper reasoning and examples. There are, however, some disadvantages. Primary school teachers are generaiists, and may not have the necessary language skills themselves. If specialists have to be brought in to deliver these sessions, the flexibility referred to above is diminished. If primary language teaching is not standardized, secondary schools could be faced with a great variety of levels in different languages within their intake, resulting in a classroom experience which undoes the earlier gains. There is no advantage if enthusiastic primary pupils become demotivated as soon as they change schools. However, these issues can be addressed strategically within the policy adopted. This paragraph focus on the disadvantages of foreign language learning in primary level. The sentences next to topic covers the odds of language teaching in primary schools and imply the significance of making primary level language teaching standardized with appropriate policies. Part of the explanation for that paragraph having an outstanding grading is that the argument left no room for biasness. Here`s is another example of a very good argument with proper reasoning. This is taken from the recent radio speech of Barack Obama with Prince Harry- about irresponsible internet media use. One of the dangers of the internet is that people can have entirely different realities. They can be just cocooned in information that reinforces their current biases. The question has to do with how do we harness this technology in a way that allows a multiplicity of voices, allows a diversity of views, but doesn’t lead to a balkanization of our society, but rather continues to promote ways of finding common ground. Bottom-line: Hone your academic argument skills to dominate the pinnacle of band score. There’s been a lot of buzz about ending markup and score. Even in the Cambridge IELTS 7 students book-an examiner comment about a band 7.5 essay exactly as "signaled conclusion- make him achieve more than band 7". Signaled conclusion gives examiner a better understanding of your essay. Moreover, an ending signal as `in conclusion`, `in the end` gives a better coherence to an essay. However, according to our analysis, the presence of signaled conclusion had no relationship with band scores. “In conclusion, I think this is a very good idea, and I hope this program will be put into action for high schools/colleges shortly”. After reading all these examples from band 9 to band 5, do you notice any difference? Key Insight: Feel free to write a signaled conclusion in your essay. But don’t expect it to have an impact on your band score. Good spelling and punctuation is a necessity to achieve higher band. Yes, there is no escape from this. Band 5 : Frequent Spelling & punctuation mistakes. Band 6 : Occasional inaccuracy in spelling and punctuation. Band 7 : Few Error. Band 8 : No Error. Why spelling and punctuation are important? The answer is to convey the meaning precisely. Without punctuation nobody knows where to stop or where to start reading a sentence of your text-nobody knows what you actually mean in your text. And bad spelling can overshadow the meaning a sentence. So, it may happens that the examiner think you mean one thing, when you really mean another. The purpose of an essay writing is to tell other people your ideas, To transfer your thought into examiner`s mind. You do this through words and sentences, through building supporting paragraphs from the introduction and then a short conclusion. To do this most easily and effectively, you must separates different points into distinct paragraphs so that the organizational pattern of your essay is transparent to the reader, contributing to its readability. A good paragraph is convincing with sufficient support and discussion, but at the same time, each one must develop around a single topic. Saying all these imply that an essay with a good paragraph structure can boost clarity or readability, which should therefore improve band score. 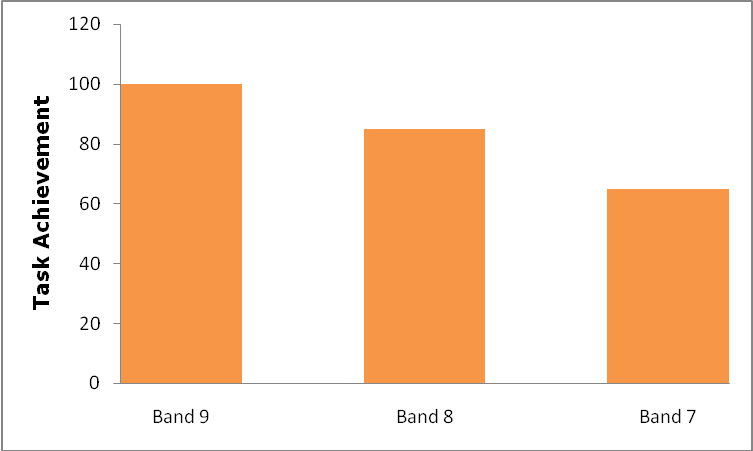 To measure the impact of paragraphing on grading we looked at the presence or absence of good paragraphing in high band responses (in other words, in the answers of Cambridge IELTS books). According to examiner comments, responses with good control over paragraphing are significantly better than having no control at all. This suggests that there’s a point of good paragraphing when it comes to scoring. IELTS examiner doesn’t only look for clues that and essay responses the test question properly or not, but also they review the sentence structures contain in the text. Some answers below band 7 generally relies on a fixed approach to writing sentences, for example-simple or compound sentence structures. Many low band answers are filled with set phrases used as a paragraph ‘template’, results in an answer that does not respond in the right way to the test question. It appears that high band answers (above 7)uses a wide range of English sentence forms covering simple to complex or a blend of complex-compound structures to show a very strong command over language in the essays. 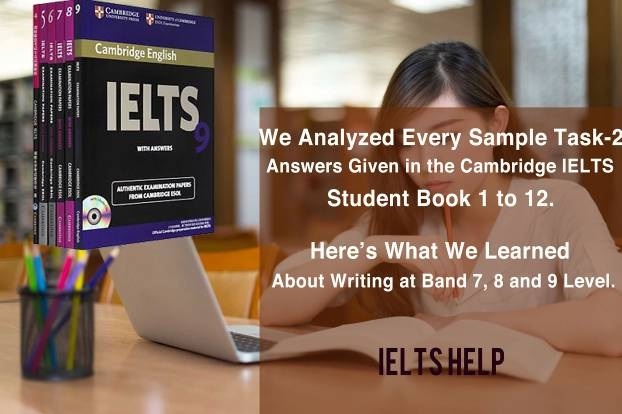 Knowing that, it`s likely that the IELTS candidate who demonstrates consistent control over complex and varied sentence structures, essentially error free, all over the response-scores more than band 7. Accuracy as the use of complex sentences, coordinating conjunctions play a crucial role here. You may have heard that using synonym of repeated words has a good impression on the IELTS response. According to our analysis, this appears to be the case. We found that lexical diversity has a substantial impact on grading. In band 7 answers, we discovered that the range of vocabulary is adequate to convey the writer’s ideas clearly but is not always appropriately used. The essay has instances of successful use of lexical phrases (“it takes time and energy”) and others where vocabulary is awkward or incorrect (“extends his sight”). There is a wide range of appropriately used vocabulary. While in band 8 answers, there are a few cases of slightly awkward vocabulary use and these minor errors with lexical mechanics detract slightly from the overall impression created by those excellent essay. On the other hand, the band 9 answers have a wide range of appropriately used vocabulary. In those responses a lot of prompt specific low-frequency vocabulary produced, where these uncommon lexis covey the meaning of sentences more precisely with sophistication. For your kind information, low frequency words are words that uncommonly occur in English language, such as “diaphoretic,” and “equinox”. Key Insight: Examiner wants to see different low and high frequency words covering your text. And the more accurately you use them, the more impression you have in the eyes of your examiner. Words together make a sentence and sentences together make an essay. Words join together to make a sentence by following grammatical rules. But, sentences perfectly join together to make an essay by the rules of cohesion and coherence. 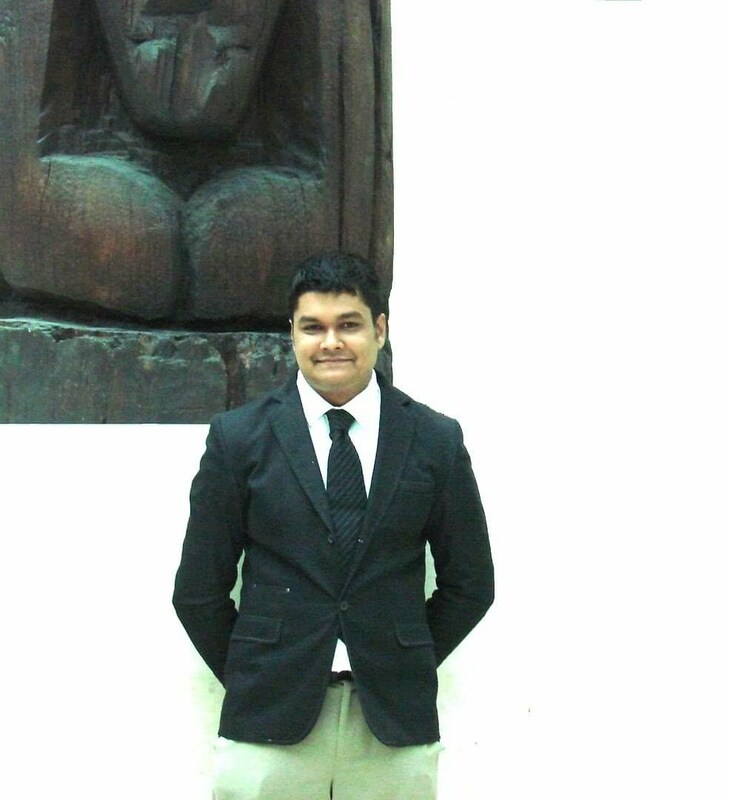 IELTS examiners look for this perfection. In other words, they would appreciate it if there were verbal road signs that your ideas is continuing in the same direction or that it`s now going to turn. Proper use of cohesive devices ensure these road signs in an essay. Our observation shows, in high band answers, the writer employs an impressively wide range of cohesive devices and organizational structures flexibly to build coherence and cohesion and create a fluent style in the essay. Conversely, there is little connection of ideas across sentences in low band answers. The reader needs to reformulate meaning in order to understand several part of the composition. In other words, very low graded answers, generally relies on mechanical use of linking device. Limitations in cohesive range make connections between sentences choppy. The reader need to struggle derive the whole meaning from the essay, although error-free sentences are plenty. Key Insight: Laying down cohesive markers is a good practice for getting a top writing band score. In early days of writing composition in high school, students like you relied heavily on grammar for English sentence making. For example, use of structures like not only..but also, use of WH words to make complex sentences etc. Today, you can "rely" on same grammatical rules to write in IELTS exam. Bad grammar did not bring you good results in high school. The same is true for the IELTS writing test. Band 6: Grammatical error seldom prevents meaning from coming through. Band 7: Well controlled grammar with some inaccuracy. Band 9: Very rare grammatical error. Key Learning: Popular Suggestions like “Just forget about grammar when you deal with English” does not work in the IELTS test. Your answers have to have correct grammar. Leave a quick comment below right now. Also, I would like to inform you that after a long research and trying many methods with my students for the last 10 years, I finally got simple IELTS Writing preparation method that really works to get over band 7. I demonstrate these methods in a detail explanatory guide to make your preparation as easy as possible. If you are interested to study this guide , you can visit this link. How can i get into free correction services. As of now the link above is not working. Hi, Ajay. Thanks for your query. I`ve inbox you about free correction service. this analysis is so amazing! very helpful! I'm also impressed by this analysis and I request free correction services too. My face book is whitez zoe as I do not know how to give URL Or how can I contact you? Thank u! Sir, can I get all cambridge(book 9 to 12) writing task questions (both task 1 and task 2 in academic with standard answers.